This document is a summation of our current assessment of the program of the Revolutionary Communist Party. It arises out of a series of discussions carried out within Revolutionary Initiative and with comrades from the RCP. 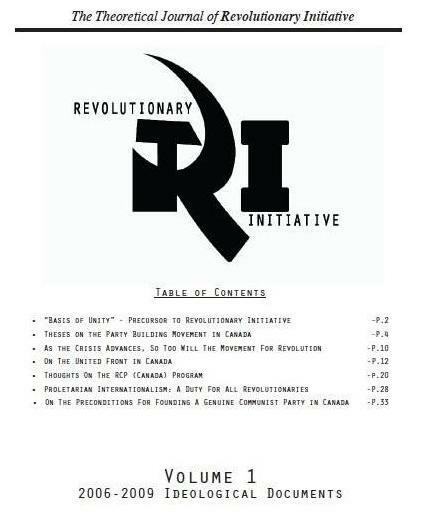 Our assessment must begin with the recognition that the purpose of Revolutionary Initiative is the formation of a single genuine Communist Party in Canada and that the RCP is currently the most advanced Party-building project in this country. It is guided by Marxism-Leninism-Maoism, is sincerely committed to the revolutionary transformation of Canadian society and has overall made a positive contribution to the movement for revolution in Canada. As Maoists, we must analyse their program carefully, clearly assess it’s perceived strengths and weaknesses, and identify where our understanding of Canadian society and the path to revolution differs. Only in this way may we develop a better understanding of our own line, potential barriers to unity that must be overcome, and areas of study that require greater investigation. We must do this in the spirit of comradeship and revolutionary humility, with the understanding that in the end it will be the masses who decide which line is correct. This assessment will take the form of a section by section analysis of the RCP program. The first great strength of the RCP program is in its purpose. It is clearly a program to unite the vanguard and build a disciplined Party to lead the working class. In this respect it clearly avoids the errors of the Trotskyists in their attempt to build a revolutionary mass Party, which leads to a muddled political line based on unprincipled unity, the watering down of revolutionary ideology, and all the opportunism that these entail. While the Party must be able to lead the broad masses, it must take care to maintain its organizational and ideological cohesion. It also makes a clear division between the Party and the class that it leads, correctly understands the Party as being the General Staff of the proletariat. Armed with this understanding, the Party can combat any trends towards liquidationism that would surrender the role of the vanguard. Another strength is the RCP’s adherence to the most advanced form of proletarian ideology, namely Marxism-Leninism-Maoism. The proletarian revolutionary movement must be guided by a correct scientific understanding, one that is based on the lessons of more than a century of revolutionary struggles combined with the creative application to local conditions and particular historical circumstances. The RCP program correctly identifies the class on which the revolutionary Party must rely: the proletariat. It is the proletariat that is the most advanced and revolutionary class, the only one that will lead the revolutionary transformation of Canadian society. However, this class is not homogeneous, and is stratified between more and less privileged sections. It is this less privileged section that has the most immediate interest in revolution, is the least infected with bourgeois ideology, and will at least initially constitute the bulk of the revolutionary forces. However, the Party cannot rely solely on this section of the proletariat. It must organize the bulk of the proletariat. While we must recognise the labour aristocracy as being bourgeois agents within the working class movement, the upper stratum of the proletariat are also objectively revolutionary and absolutely necessary to the socialist movement. While currently more susceptible to petite bourgeois aspirations and ideology, with the decline of imperialism they are facing a steady erosion of their more privileged position, with mass layoffs, union busting, and declining wages and deteriorating social conditions becoming the norm to imperialist society. This section of the working class is also the most skilled and disciplined of the proletariat, and most able to construct the future socialist society. In addition to the proletariat, the Party will have to win over other classes and weld them together into the third great weapon of the proletariat (after the Party and the People’s Army), the United Front. In addition to the bulk of the proletariat, the United Front will include in a supporting role some sections of the petite bourgeoisie. This includes professionals, academics, independent commodity producers such as farmers and fishermen, and independent property owners that do not exploit proletarian labour as the main part of their income. This class stands in objective contradiction to monopoly finance capital and will be a vital ally of the proletariat. They are an unstable and vacillating class and must be won over to the revolution, otherwise they will be organized by the counter-revolutionaries against the proletariat and come out in favour of state repression during upsurges in struggle. Another class that may be a temporary ally of the proletariat in the United Front will be some elements of the non-imperialist middle bourgeoisie. This is the section of the bourgeoisie that is not a part of the monopoly capital ruling class and do not principally depend on imperialist exploitation of the Third World and the world market. The production that they control is entirely nationally based and they are generally opposed to the policies of globalization. Their expansion is regularly thwarted by the imperialists that use their position of dominance to prevent the development of any competitive capitalist rivals. While not a historically progressive class, wining them over to the revolutionary camp will play an important role in isolating and undercutting the room of manoeuvre of the ruling class, blunt their attacks on the proletariat and weaken the capitalist class as a whole. For the proletariat to develop revolutionary ideology it is necessary to understand one of the primary bourgeois ideologies masquerading as proletarian ideology, namely modern revisionism. While the RCP program correctly analyses the rise of modern revisionism in the Bolshevik Party, it does not sufficiently address the origins of revisionism in the Canadian movement. With the rise of Khrushchev, the Bolshevik Party became the world headquarters of modern revisionism, actively promoting revisionism amongst the International Communist Movement. Yet the revisionist current was already dominant in the Canadian Party long before Khrushchev’s coup. During WWII, the CPC dramatically changed it’s ideological and political line and adopted the so-called “Popular Front” strategy. While claiming to be the faithful implementation of the United Front strategy put forward by the Comintern under Dimitrov, the Popular Front strategy was a bourgeois democratic line that called for the liquidation of the Canadian revolutionary movement. Communist mass organizations and trade union centres were shut down and along with a drive towards bourgeois “respectability” the Party was purged of much of it’s genuinely proletarian members. The leadership of the proletariat was placed under Mackenzie King’s Liberal Party, a party of the imperialist bourgeoisie. WWII was the deathknell of the first Communist Party in Canada, during which it ceased to be a revolutionary Party and slid into an obscurity from which it has never recovered. The process by which this occurred deserves close scrutiny if we are to avoid repeating these errors. The RCP program correctly identifies Canada as a major imperialist power, breaking with the bourgeois nationalism that infects much of the Canadian left. Many progressive groups incorrectly view Canada as a dominated country and focus much of their anti-imperialism on American imperialism, assuming (incorrectly) that Canada is oppressed by the United States. While Canada is a second tier imperialist power and occasionally at a disadvantage to American imperialism, overall it participates in the international division of labour as a dominating and exploiting imperial power. It frequently operates in concert with the United States on various imperial adventures, but it does so for its own interests. The Canadian state is not “holding the bully’s coat”. It is a bully in it’s own right and it is this reality that the RCP program exposes. While imperialism is the highest stage of capitalism, that stage has distinct phases, each with their own particular qualities that effect the strategy and tactics of the proletarian revolution. The RCP program is overly focused on the conditions of global capitalism and lacks analysis of the particular historical stages of the Canadian mode of production. Of particular importance is an analysis of the current phase of Canadian imperialism, which is the phase of strategic decline. This phase is characterised by persistent and endemic economic stagnation, the financialisation of the economy, the expansion of overall size of the state and its increasing fusion with monopoly capital. The program of the revolutionary Party must include an analysis of the persistent stagnation endemic to monopoly capitalism, the growing financialisation of the economy, and the susceptibility of imperialism to larger and larger crises. Otherwise, this may result strategic and tactical errors based on an overestimation of the stability of imperialism and a lack of attention for the need to prepare for major crises in the imperialist system. The tendency of monopoly capitalism towards persistent stagnation has forced the imperialists to bring in a greater role for state planning and management of the economy to stave off crisis, these measures have not been able to eliminate the inevitability of crisis. While they have been able to stave off minor crises, their methods – such as outsourcing of production and massive growth of the financial sector – have only delayed the inevitable and actually increased the likelihood and severity of a major crisis. This negates much of the justification for the protracted people’s war strategy, based as it is on the hypothesis that the imperialist system has more or less stabilised and secured itself against crises. Overall, we are in unity with the RCP on the primary contradiction in Canadian society as being between the proletariat and the bourgeoisie. It is these two classes that form the antagonistic contradiction that makes up Canadian imperialist society. This formulation clarifies our struggle, breaking with the petite-bourgeois lines of the post-modernist and identity politics which fragments the struggle of the proletariat. It is the proletariat, composed of a variety of sectors, that will lead the struggle for socialism. Within this class, it is the lower stratum of the proletariat which is most revolutionary and upon whose interests the revolutionary Party must rely. This stratum is currently unorganized, ignored by the current trade union movement that only defends the interests of the upper stratum and the petite-bourgeoisie. While priority must be given to the interests and the organization of the lower stratum of the proletariat, the revolutionary Party must organize and rely on the bulk of the proletariat, including it’s upper stratum. It is this upper stratum that is most critical to the functioning of imperialism and constitute the backbone of the entire economy. A key element of winning over this sector will be the transformation of the trade union movement. Currently under the control of the labour aristocracy, the existing trade unions can be considered yellow trade unions. It will be necessary to build new red trade unions with a red trade union centre to organize those sectors of the working class that are currently not organized. However, this red trade union movement will not be able to displace the yellow trade unions. It will be necessary to enter the yellow unions and build cells of revolutionary mass activists within individual locals. Those cells will change the character of the individual locals from yellow to red and then spread out into other locals, gradually ousting the labour aristocracy and changing the union as a whole into a red trade union. The same process must continue, local by local and union by union, until the labour aristocracy have been driven from the working class movement. For the proletariat to liberate itself, it must identify and understand it’s opposite, the imperialist bourgeoisie. The imperialists understand this fact and try to the utmost to conceal its existence. Bourgeois nationalism only diverts the proletariat from it’s genuine struggle, while divisions by political jurisdictions (between federal, provincial, and municipal levels of the bourgeois state) are only used to hide the overall unity of the ruling class. The imperialists also deliberately intervene in the proletarian movement, buying off and co-opting sections of the movement through state hand-outs to ally workers organizations to this or that section of the bourgeoisie. Although united overall, the bourgeoisie has its own internal contradictions. While the RCP program acknowledges these divisions within the ruling class, more work needs to be done on the exact structure of the bourgeoisie, it’s various factions, where the bourgeoisie is divided and upon what interests that division is based. In this way the proletarian movement can develop the correct tactics to split the bourgeoisie, directing it’s fire on the faction of currently wielding state power and exposing the opportunism of the bourgeois opposition. We have no disagreements on the main points in this section: The working class exists. It has not “vanished”, but rather makes up the majority of the Canadian population and constitutes the main and leading force of the revolution. It is also stratified and contains its own internal contradictions. Organizationally, the proletariat is dominated by the bourgeoisie and its agents within the working class movement. The Party must rely on the interests of the lower stratum of the working class, leading the bulk of the proletariat to act as a class in itself. There is a need for further discussion on the use of debt as a means of supporting the upper stratum, how this is inherently unstable, and the role of debt as a means of seizing an additional cut of surplus value. It is on the national question that the RCP has made a major contribution to the proletarian revolutionary movement in Canada that should not be underestimated, specifically the recognition that Quebec is an imperialist power. While the French nation in Canada was once a dominated and exploited nation with a justified national liberation movement, since the late 1970’s it has transformed itself into an imperialist nation with a strong state, an economy that is fully integrated into Canadian monopoly capitalism beyond its formerly subordinate position, and has the maximum of democratic rights that can be expected of a bourgeois society. It has developed its own imperialist ruling class that is engaged in the exploitation of the Third World. Many of the so-called “revolutionary” or “progressive” organizations in Canada have a poor understanding of these changes in Quebec society and still hold to the line of independence for Quebec. This ignores the fact that the sovereigntist movement is (as the RCP correctly characterises it) a “100% bourgeois project” that would not achieve any advancement for the working class of any nation in Canada. While the right of nations to self determination up to and including succession is an iron principle of MLM, it must be considered in relation to the concrete context to which it applies. In the case of Quebec today, independence would only be used as an excuse to extract greater concessions from the working class and further embolden a new imperialist state on the world stage. While claiming to speak for all women, bourgeois feminism is incapable of addressing the social contradictions that oppress the majority of women as it cannot by its very nature address the question of class power or go beyond the bounds of bourgeois legality. Instead it relies on a false community of sisterhood that obscures the class division of society and puts forward a concept of patriarchy that no longer exists as a historical category. Patriarchy is a specific form of property and social relationship that has been destroyed by the development of imperialism. The strategic decline of imperialism has forced that system to rely more and more heavily on individualized consumption patterns, the expansion of wage-earning, the increased use of science in production, and other efforts which broke down patriarchal property and social relations. To maintain that there is a contradiction between all women and “the patriarchy” creates incorrect lines of struggle and will only hold back proletarian women from their genuine liberation. This line is mainly put forward by bourgeois or petite bourgeois elements in the women’s movement, diverting women’s struggles away from the fight against capitalism and diverting them towards the dead end of identity politics. This is not to say that women do not face greater exploitation and oppression than men in the workplace and society at large. While patriarchy as a legal property relation no longer exists, women still face systematic oppression. There is need for greater detail on the forms of gender oppression that women experience today, with special emphasis placed on the forms of oppression that women face that hold back our female comrades from their full participation in the revolutionary movement. Proletarian women still need feminism to liberate them from gender oppression, but it must be a feminism of a new type, a revolutionary feminism that organizes proletarian women to fight their sectoral oppression as a component of the general struggle against imperialism and for revolution. Women have played central roles in many communist movements and national liberation struggles in India, Nepal, the Philippines, Peru, and within the Black Panther Party of the 1970s. For a new generation of female leaders to be developed, all vestiges of male chauvinism in our movement must be vigorously combated and special emphasis placed on the development of female proletarian revolutionaries. 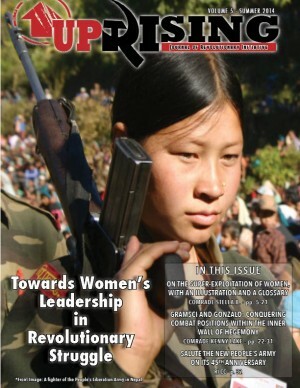 The RCP program correctly calls for the creation of a revolutionary proletarian women’s movement, however owing to the program’s lack of attention to the question of the United Front, there is a lack of clarity on how the Party will develop this movement and what it’s relationship will be to the Party. The Party must form women’s mass organizations that will carry forward the demands raised by the Party program, as well as demands raised by the masses themselves. 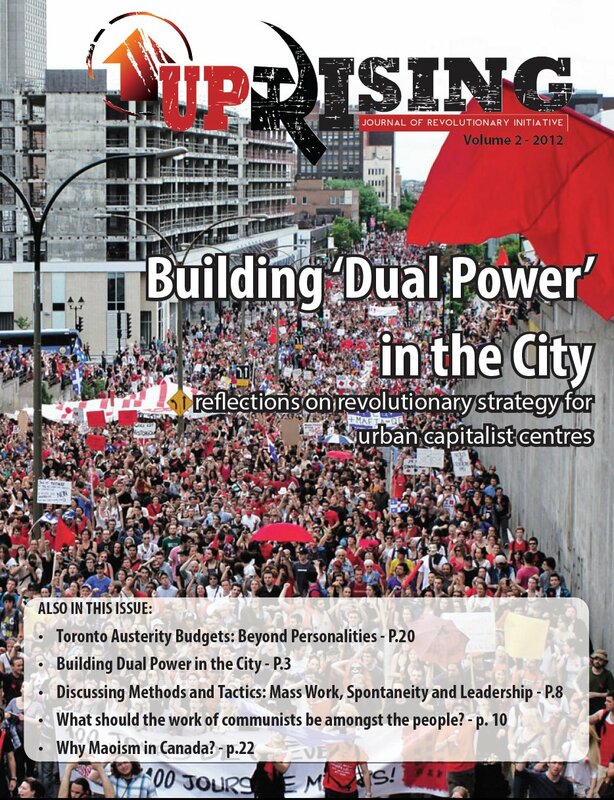 We are united with the RCP on the ultimate goal of the revolutionary Party – the transformation of Canadian imperialist society into a communist society. This shall be carried out through the establishment of the dictatorship of the proletariat and the construction of the socialist order as a transition stage to communism. This stage will necessitate the destruction of imperialism not only in Canada but world-wide and the uprooting of the “four alls” – all class distinctions, all relations of production upon which they rely, all social relations that correspond to those relations of production, and all ideas that result from those social relations. History has shown that this will be a protracted struggle, with ebbs and flows in the revolutionary tide. During the transition to communism class struggle will continue, both in Canada and against the remaining imperialist powers. The bourgeoisie will of course resist this transition and their resistance will increase tenfold with their loss of state power. This resistance will take direct forms (such as economic sabotage, assassination of proletarian leaders, and other acts of terrorism), but will also be regenerated indirectly through the force of habit remaining from the old society and the continued existence of small production. New bourgeois forces will reconstitute themselves, some of them from within the revolutionary Party itself, especially from it’s highest levels. These bourgeois forces must be constantly struggled against, both by the revolutionary Party and by the masses until all vestiges of the old society are finally eliminated. In addition to the measures listed by RCP, there are additional initiatives that will need to be undertaken by the proletarian state in the construction of socialism. First, there is the matter of how to deal with the non-imperialist middle bourgeoisie. It is critical that the revolutionary state avoid driving any more sections of the population into the enemy camp than is absolutely necessary. Some sections of the non-imperialist middle bourgeoisie should be retained as managers or technical advisers of the enterprises they owned under the old society. Their income may be based on a fixed percentage of the enterprise’s profits or a salary. This position will be non-inheritable to ensure that this remainder of the capitalist class will be eliminated within a generation. Others will be offered buy-out packages. In either case, this may place their income above the “communist maximum” but will undercut their opposition to the socialist transition and be in the overall best interest of the proletariat. Secondly, there is a need for increased attention to the measures required for breaking Canada from the international division of labour. Canada is a second-tier imperialist society. It is fully integrated into the global imperialist system, both as an exploiter of Third World countries and as a branch plant economy of other imperialist powers, particularly the United States. As such, the construction of a national economy will involve significant changes to the Canadian means of production. With the liberation of significant sections of the planet from imperialist exploitation and the breaking of imperialism at home, Canada will no longer be able to rely on the Third World to provide cheap access to raw materials, foodstuffs and labour (located abroad or in Canada through the immigration of highly skilled labour). The new proletarian state will be forced to develop a comprehensive national economy capable of supplying the fundamental needs of the population, with international trade playing a secondary and supplementary role. This will involve the retooling of branch plants for the purposes of centrally planned and nationally based industrial production, recovery of farm land from urban sprawl to produce regionally appropriate agricultural products, development of environmentally sustainable power generation, and massive increases in energy efficiency in all sectors of the economy and infrastructure. The establishment of a national economy will also involve making reparations to the Third World for the imperialist exploitation carried out by the old society. The new proletarian state will inherit a debt of blood and capital that must be repaid. This will involve capital payments to nations formerly dominated by Canadian imperialism, the immediate cancellation of all foreign debts held by the former Canadian state and banks, transference of Canadian-owned fixed capital to the countries in which they are located, and the provision of technical expertise, exchange programs, and internationalist assistance to any Third World country that desires them. All of these measures will be carried out on the basis of the equality of nations, both big and small. The RCP correctly rejects the parliamentary cretinism of the revisionists, who claim that the socialist transformation of Canadian society can be carried out in accordance with bourgeois legality and the election of so-called Communists to the parliament of the bourgeoisie. There are ample historical examples that the expectation that the bourgeois state machinery can create a socialist society is a dangerous illusion that can end in only one of two ways: either the corruption of the Party and its reintegration into bourgeois society as revisionist agents of the bourgeoisie in the working class movement or a fascist counter-attack that massacres the revolutionary movement. The decisive form of struggle will not occur on a single grand day. It will be part of a longer process of breaking with bourgeois legality that will not be absolutely distinct from protracted legal struggle. The revolutionary movement must block the state’s constant attempts to reintegrate social resistance into bourgeois legality through the use of state funding for pseudo-mass organizations and the use of cooperative bodies between the state, the bourgeoisie, and the organized working class. The Party must practice dual tactics at every stage of struggle. Therefore, it is absolutely necessary for the revolutionary movement to uphold the decisive role of armed struggle and the violent destruction of the bourgeois state apparatus in favour of the dictatorship of the proletariat. The proletariat must carefully prepare and plan for armed struggle, well in advance of the launching of armed struggle in its decisive phase. This will involve the creation of trained armed units that are capable of launching tactical offensives at the time of their choosing in order to defend the Party and the mass movement. These units will form the nucleus of the People’s Army, an armed mass organization that will be organizationally distinct from the Party but always under its political leadership. However, despite our agreement with much of the points raised by the RCP in favour of their strategic line, we cannot agree with their conclusion that Protracted People’s War is the path to revolution in Canada or that armed struggle as a strategy should be launched in advance of the formation of a revolutionary mass movement. It is our view that the October Road remains the correct strategy for the seizure of power in the imperialist countries and that the RCP has only critiqued a straw-man version of the insurrection strategy. The RCP overestimates the masses willingness to break with bourgeois legality, an estimation that is heavily based on low voter turnout, particularly amongst the proletariat, during bourgeois elections. While the ever declining percentage of the population that votes is overall a favourable sign for the revolutionary movement, this should not be taken as the masses consciously breaking with bourgeois legality and acceptance of armed struggle. While there is certainly a percentage of non-voters that rejects bourgeois legality as a solution for social contradictions, there is also a likely much larger percentage that does not vote out of disenchantment with existing political parties but not a rejection of parliamentarianism as such. To raise the boycotting of elections to the level of principal is incorrect. Parliamentary struggle will be of tactical advantage and should be taken up as a component of the mass movement. At this time, it is the job of revolutionaries to expose the the true nature of the various bourgeois parties and that voting on its own will not lead to significant social change. The Party must also organize parliamentary fronts, to use the parliament as a tribune, capture resources from the bourgeois state, raise the just demands of the masses and expose to the masses the ultimate bankruptcy of parliamentary politics. Despite the many correct critiques made by the RCP of the insurrection strategy as practised by revisionist Parties or Parties that have not fully broken with revisionism, the protracted peoples’ war strategy proposed by the RCP is fundamentally flawed. Base areas, as they are conventionally defined in the theory of Protracted Peoples’ War, are liberated territories that are almost untouched by state authority, have been organized by the revolutionary movement to be a self sustaining reserve area for the People’s Army and have already begun the process of social transformation. These areas gradually expand, encircling the city from the countryside, until such time as the revolutionary forces are able to launch a final offensive and seize political power in the country as a whole. This strategy is inappropriate for countries of the imperialist centre. For one, an urban base area could not be used as a strategic reserve area. There are few areas in Canada that are outside of state control (such as First Nations reserves where the state is currently restrained by the pretence of bourgeois legality) and those areas contain only a minute percentage of the Canadian population. The vast majority of the population lives in the urban areas, where state control is at it’s highest and the response time of the armed force of the state can be measured in minutes rather than days. Secondly, a base area in an urban environment is indefensible militarily. Canadian cities were deliberately designed to prevent large concentrations of working class populations and instead places a heavy emphasis on mixed income neighbourhoods and the scattering of smaller pockets of concentrated poverty away from each other. This would necessitate that any individual base area would only be a few square city block, which could be easily surrounded and annihilated, or turned into concentration camps through the use of armed checkpoints. Thirdly, an urban base area cannot be self-sustaining. Urban areas are entirely dependent on integrated distribution systems to supply all the basic necessities of life, without which even entire cities are unable to survive. As such, an urban base area would be unable to provide for itself in the event of a siege by state forces or to provide reliable supplies to the People’s Army. Finally, and given the above factors, it is also impossible to implement social transformation in the base areas well in advance of the seizure of political power. While it will be necessary to begin the process of creating dual power through the creation of neighbourhood and factory committees and other forms of proletarian power, these forces will not be able to fully replace the bourgeois state until the period of decisive struggle. Armed struggle can and will be used in the conquest of political power, but a strategy that relies on base areas is doomed to failure. A key element in the launching of the decisive form of struggle and one that is unaddressed in RCP program, is the winning over of sections of the bourgeois military to the side of the revolution. While the armed units of the revolutionary forces will play a key role in the struggle, they will be overwhelmed by the bourgeois state if they are forced into direct confrontation with a professionally trained army. The majority of these soldiers are of proletarian origin and joined the bourgeois military less out of allegiance to the imperialist system than a desire to escape unemployment or to gain access to systems of higher education that would be otherwise unaffordable. The Party must engage in political work within the armed forces, taking advantage of contradictions within this institution and win over the rank-and-file to the side of the revolution and create forms of dual power within the military. This is likely to happen after a ruinous inter-imperialist war or with significant reversals on the battlefield with forces battling occupation by Canadian imperialism. It will be these devastating losses that will expose the masses to the harsh consequences of the imperialist system. Recent events in Europe indicate that insurrection is not an outmoded tactic for the destruction of the bourgeois state. The multiple uprisings in France, which spread into some parts of Germany, demonstrated that an armed uprising of the people is capable of overwhelming state forces. Even though the uprising was completely spontaneous, lacked a centralised underground leadership, and consequently did not have any strategy for the seizure of political power, in was able to overwhelm the entire French police force and the French state came within hours of having to call out the Army to put down the rebellion. Had these uprisings been coordinated by a revolutionary Party with the support of its allied mass movement (armed and unarmed) and strengthened by the crossing over of dissident elements within the military, the outcome would have been world-historical. The RCP strategy of Party building contains much that is an advancement over other left formations. The RCP recognizes that the Party must be a Party of a new type, one that is a central revolutionary force within the proletarian movement and not a Party of the entire class. The Party must also do more than seize leadership positions through organizational manoeuvres in order to achieve the status of vanguard of the proletariat. In order to do this it will take on the organizational form necessary to the task, one that is based on democratic centralism, line struggle, and the guiding role of Marxism- Leninism-Maoism. However, the elements of the strategy by which the RCP seeks to build the Party reveals a fundamental error in their conception of Party building. While there are some individuals who spontaneously develop a revolutionary consciousness due to exposure to revolutionary ideology, overall revolutionaries are not born – they are trained and developed. The Party must do more than rally those elements that have already developed a semi-revolutionary consciousness. It must engage in mass struggle, identify the most capable mass organizers, and through constant and gradual ideological and political work, instil in them a revolutionary consciousness and correct proletarian methods of work. This method is distinct from economism, which views mass struggle as an end in and of itself and fails to integrate mass struggle into an overall process of building the revolutionary movement and the revolutionary Party. 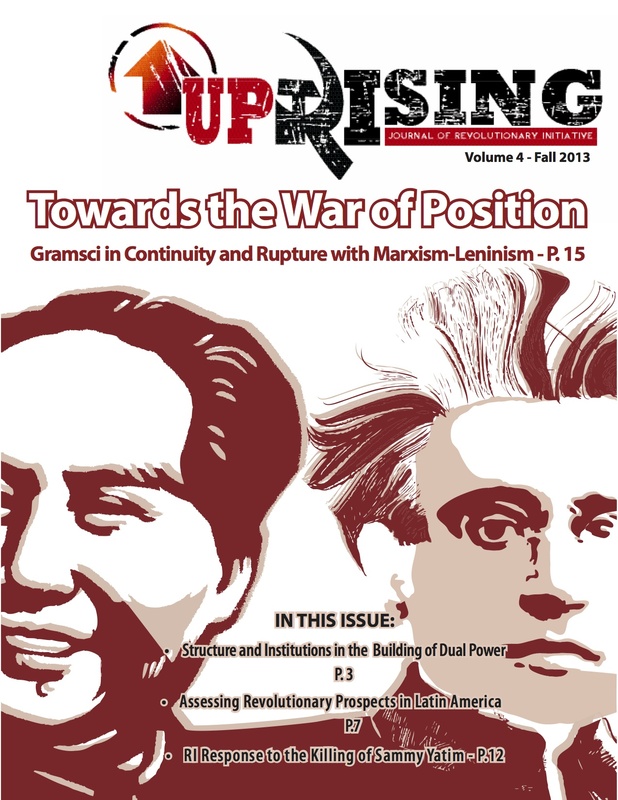 While justifiably seeking to avoid economism, the RCP’s “skimming” approach over-relies on spontaneity – both in the generation of revolutionary consciousness and in upsurges of mass struggle. This method lacks a method of testing through revolutionary mass work and a step by step development of proletarian revolutionaries. We are also concerned by the RCP’s conception of line struggle, which tends towards an idealist understanding. It is only partially true that “correct ideas don’t come out of the blue. They develop in the fight against erroneous ideas.” This truth is one-sided because it ignores the basis upon which truth or falsehood is established. Correct ideas will be proven through practice and the concrete results of the lines in question as they are applied through struggle. Practice is the ground upon which truth and falsehood will be established and ultimately it will be the masses that will decide which line is correct or incorrect. We are in overall unity with the RCP on the question of the Red Army. The formation of a Red Army will be necessary to defend the revolutionary movement. It must be distinct from the Party but under the leadership of the Party, following the direction of the Party in its military and political work. There is a need for further discussion on how the Red Army will relate to the legal struggle, how it will maintain its clandestine nature, and how this will relate to political work inside the bourgeois military. Overall, this section of the RCP program is bang on and correctly articulates the purpose of the revolutionary Party: to organize the masses into a material force for the transformation of society. It does this through the mass line of “from the masses to the masses” – gathering the scattered ideas of the masses, systematizing them, and presenting them back to the masses in a manner that encourages the masses ideological development and fighting capacity. The Party gains leadership of the masses not through organizational manoeuvres, but through careful ideological and political work, always with the goal of guiding the masses in assuming control of their own movement and preparing them to take charge of society as a whole. However, on the question of stages of development of the overall revolutionary movement in Canada, we disagree with the RCP program’s conception of Party building as being a separate stage that occurs in advance of the formation of mass organizations, that “communists must work firstly to build the highest form of proletarian organization— the Revolutionary Communist Party .” There is no need to wait for the formation of a Party to begin the process of mass work and the building of mass organizations. Indeed, these are not stages, but interconnected elements of the overall revolutionary project. These elements must occur simultaneously and dialectically, as neither will develop beyond initial stages without the other. Even from the stage of a pre-Party formation, proletarian revolutionaries must steel themselves through mass struggle and the building of mass organizations, linked together through the underground revolutionary organization. These mass organizations are the conveyor belt that connects the Party to the masses, functioning both to elevate the organizational strength of the masses and to act as a training ground for the development of proletarian revolutionaries. It is this practice that will prevent the Party from either becoming a sect, divorced from the masses and mass struggle, or falling into the trap of economism, where the Party itself becomes bogged down in the immediate struggle of the masses and fails to develop the masses’ own capacity for struggle. This document is only a first step in building our understanding of the RCP and is not intended as the final word on the nature of the RCP. However, we can say that overall the RCP program marks a great advance in the movement for the development of a genuine Communist Party and is leaps and bounds ahead of most other left formations in Canada. 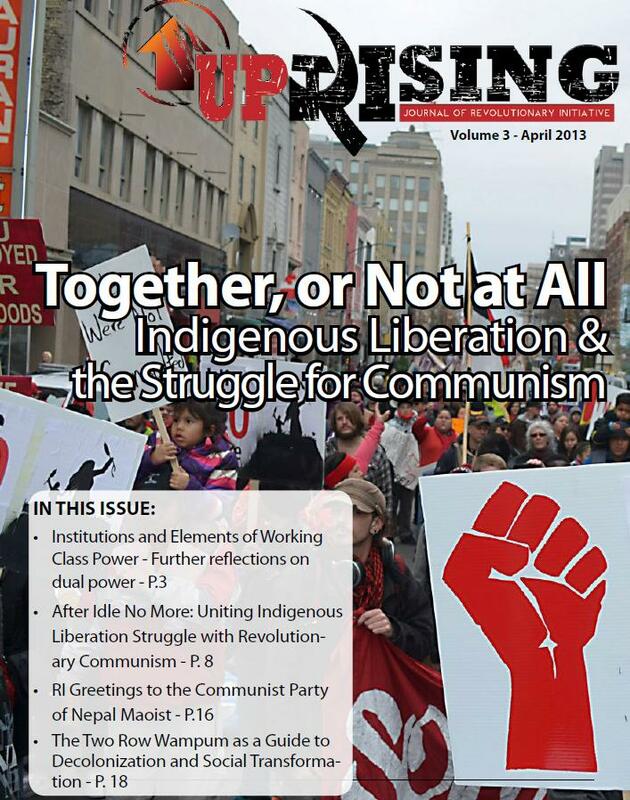 Their adoption of Marxism-Leninism-Maoism as their guiding ideology, basic understanding of the class forces in Canadian society and Canada’s role in the international division of labour, rejection of opportunism, and commitment to building a revolutionary Party are all in line with the Theses on the Party Building Movement in Canada document that guides our organization. Despite these positives, there are still significant major differences between the lines of RCP and RI, most importantly the military strategic line of PPW for Canada and the Party-building methods proposed by RCP. There are also areas that are under-addressed in the RCP program and require greater investigation to determine if differences exist and the importance of those differences. These would include the role and form of the United Front and how the Party relates to the mass movement. In order for us to deepen our understanding of the RCP and strengthen the relations between our two organizations, it will be necessary to increase our level of dialogue, greater exposure to the each others work amongst the masses, the initiation of joint cooperation on (initially) small scale projects, and comparing the objective results of the carrying out of our lines amongst the masses. Care must be taken that our discussions with the RCP remain grounded, comradely and objective and not degenerate into back and forth polemics. Our unity will be built as part of a long term and gradual process, one that must end in the creation of a single genuine Communist Party to make revolution in Canada. Long live the Party-building movement in Canada!